There’s a certain magic at play at half dusk, and the Le Poeme wedding headpiece was inspired by the warmth and nostalgia of an enchanted ombre sky. Designed for a woman drawn to pale rose tints and raw romanticism, Le Poeme is opulent and decadent in its detailing. Characterised by antique silver metals, peachy blush tones interspersed with rose gold accents, this feminine and organic piece is unashamedly feminine and romantic. *LIMITED QUANTITIES – Due to the popularity of the Le Poeme headpiece, we have limited materials available to create this design. If you love this headpiece, we recommend you secure it before we are no longer able to recreate it. The Le Poeme headpiece is made to order. Please allow 2-3 weeks for production plus delivery times. A blush beauty, the Le Poeme headpiece is a delicate piece that complements both traditional and non-traditional bridal looks. We love to style it with vintage-inspired wedding dress, low backs, blush pink wedding dresses, illusion necklines or long lace sleeves. Le Poeme is a flexible and versatile design that can be manipulated to the shape of your bridal hairstyle or hair bun. 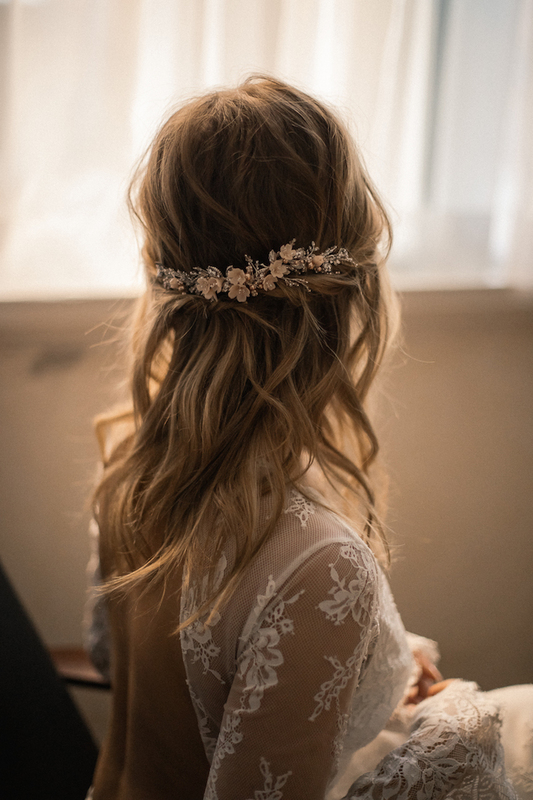 Wear it in a half up/half down hairstyle to frame a veil’s comb, or position it above a bun for a classic and sophisticated look that’s feminine on all levels. If you’re envisaging a high set bun, Le Poeme can be curved to frame the bun beautifully and set on top of a wedding veil. Le Poeme can be worn with or without a wedding veil. It’s a flexible metal piece that can be curved to the contours of your bridal hairstyle. The distance between the combs on the headpiece allow for a veil’s comb to slot in between seamlessly creating a clean and sophisticated bridal look. If worn with a veil, pair it with a veil with minimal gathers at the comb for a more seamless finish. Browse our full veil collection or contact us and we’d be happy to offer a recommendation to suit Le Poeme based on your wedding dress and hairstyle.